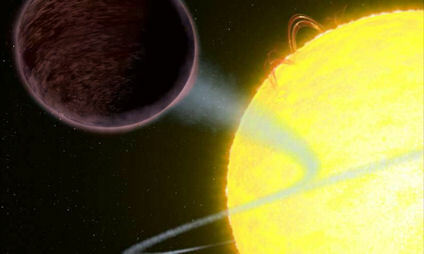 A sub-brown dwarf planet has been found to be as black as asphalt (1). The pitch-black nature of the 'hot Jupiter' world known as Wasp-12b brings this object very close indeed to my decades-old description of a 'Dark Star' (2). This strange world is an exoplanet between two and three times the size of Jupiter (but about 1.4 times its mass) which is orbiting incredibly close to its parent star, WASP-12A, located about 1,400 light years away. Its proximity to the star has distorted its ballooning shape into that of an egg, and has created surface temperatures of approximately 2600 degrees Celsius. This hot Jupiter world was detectable because of the gravitational effect it has upon its parent star, causing the star to wobble. It would be practically impossible, then, to detect a dark Jupiter-sized world like this using visible light. If its remarkable atmospheric conditions, and extremely low albedo, are functions of the heating effects of its proximity to its parent star, then this creates no precedent beyond its own class of hot Jupiter. But, one must wonder whether there are other worlds out there, located in a more 'normal' position around stars, or free-floating in interplanetary space, which are similarly dark, and thus incredibly well hidden from our sight. Although there has been no news yet about the whereabouts of Planet Nine, the super-Earth/mini-Neptune shaped Planet X object now thought by many astronomers to be lurking in the outer solar system (1), there is no shortage of theoretical work going on to determine the origin of this elusive object. Because of the normal size of protoplanetary disks around young stars, there is insufficient material at the distances Planet Nine is likely to be located for it to have formed. So, its presence, if confirmed, would need to be explained in other ways. It may fit into the generally accepted Nice model of solar system formation as an early protoplanet which migrated outwards during a period of high volatility when the major planets were shuffling around rather chaotically. Any ejected world would most likely end up entirely cast out of the solar system, but there's a working chance that it hung onto the system's cliff edge by its fingernails. 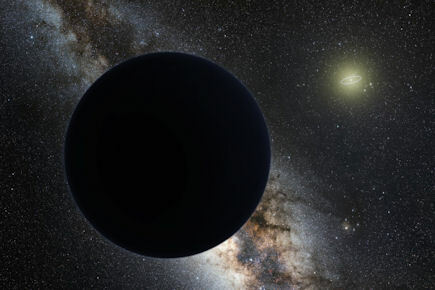 A second scenario is that Planet Nine may have been an exoplanet, born of another system, which was captured by the Sun in the early lifetime of the solar system (2). Neither of these scenarios would have been considered very likely a generation ago, but the discovery of a menagerie of bizarre exoplanets has raised the awareness of many that the universe produces many oddities. Possibly this is just how statistics work. Even if the odds against something happen seem remote, if you spread your gaze across millions of star systems, then you'll still end up finding these oddities. Perhaps, then the solar system has thrown up Planet nine as just one of these oddities. But, despite the rationalism of science, we humans retain just a bit of pride in our local cosmic hunting ground, and tend to think that we're somehow special, or have the perfect conditions, or whatever (think of the argument for life in the Cosmos). So, where the Earthly bird of paradise sits on a perch of perfection, Planet Nine is more like a misfit mongrel locked away in the cupboard. It doesn't fit, it shouldn't be there, and if we stop paying attention to that irritating baying noise, it'll simply go away. So, there have been several calculations done using powerful computers which indicate the low probability of Planet Nine's formation. The latest academic attempt to model the origin of Planet Nine comes from an international team led by Richard Parker of the University of Sheffield (3). Using advanced computer programs, they simulated the Sun's original star-forming region of space - likely a much denser cluster of stars than our current galactic environment - and then adjusted the model to make it as easy as possible for a star to capture a planet from one of its siblings (4). Lots of assumptions in this work, of course, perhaps all of which are well-founded theoretically, although the population of free-floating planets compared to stars is pretty much guesswork at this stage, given how incredibly difficult FFLOPS (great name) are to find. The upshot of this is that Planet Nine has a vanishingly low chance of being a captured exoplanet, even if it's from a neighbouring 'stellar sibling' (5). These stellar siblings may even include a birth twin of the Sun - there is evidence to suggest that all stars are born with companions of one form or another, which become separated early on (6). So, maybe this latest work isn't being as generous towards the 'capture' scenario as they're making out. At the moment, there is no concrete evidence for the existence of Planet Nine (or any other substantial Planet X body), so how it might have got there is a theoretical exercise to entertain the minds of astrophysicists, and push what is thought to be theoretically possible to the very limit. However, once Planet X is found, then the scepticism is cast off and efforts to figure it all out will take on a whole new impetus. There are two major asteroid belts in the solar system. The traditional belt lies between the planets Mars and Jupiter, and is relatively dense and compact compared with its colder, more distant cousin, the Kuiper Belt. Both belts are thought to have formed with far more materials than they have now. Their populations of objects have dwindled down over time due to collisions, scattering encounters, and so on. But is this necessarily the case? 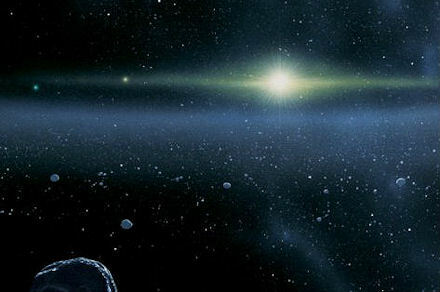 There have been many arguments made down the years that the main asteroid belt was once a planet in its own right which was impacted by a rogue body (1), or that an hypothesised fifth inner planet (known as Planet V) was perturbed into an asteroid belt-crossing orbit (2). Both of these scenarios would explain the phenomenon known as the late, heavy bombardment, which took places over a few hundred million year, starting about 3.9 billion years ago. 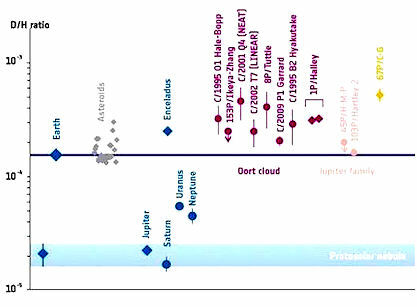 The break-up of a large planet within the current asteroid belt has also been considered by astronomers down the years, but is thought to be a highly improbable event (3). 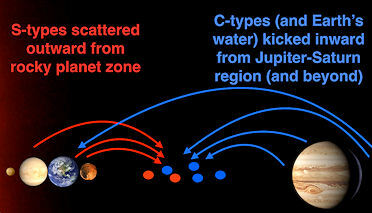 Instead, the accretion of smaller planetary embryos may have driven scattering in the region. Alternatively, Jupiter's massive gravitational effect on this region is a possible factor, including its resonance relationships with Saturn, and their wider involvement in the migration of gas and ice giants during an unstable phase of the early solar system. This is part of the generally accepted theory known as the 'Nice model' of solar system evolution, where gaseous pressures within the protoplanetary disk are thought to drive significant planetary migration. 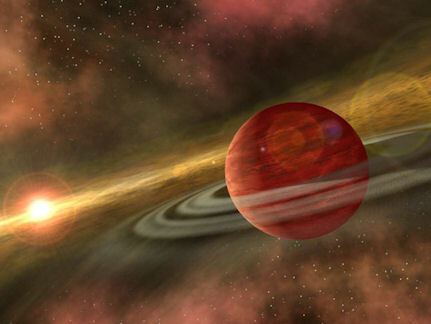 These excursions may have involved one or more now missing additional giant planets or giant planetary embryos (4), which were ejected from the solar system. The Planet Nine hypothesis gives a nod to this model by arguing that the proposed planet was originally just such an ejected planetary embryo (5). Therefore, the researchers argue, the asteroid belt may be a conglomeration of building materials left over from the early stages of the solar system, driven both outwards from the inner system of rocky planets, and inwards from the gas giants beyond. In other words, the asteroid belt is a big pile of left-over rubble, dividing the two main planet-forming regions of the solar system. The objects within the asteroid belt did not start there, they argue, but are instead refugees from other planet-forming zones, or rings, of the protoplanetary disk. Their computer simulations support that possibility, although that's far from offering proof for this controversial hypothesis. One might counter all of this by pointing out the growing complexity of these various mechanisms. To make the models 'fit', instabilities within the rotating gaseous nebula around the forming Sun form rings of material, which then accrete into planets. Then the remaining nebula materials create enough gas drag effects to cause these outer planets to migrate away from their initially stable resonant birth positions. This unstable period may cause the ejection of early planets, now lost. Also, now, various smaller bodies are caught up in these migratory patterns, and are flung into new zones, previously unoccupied. Like I said, this is hardly Occam's Razor at work here. I would argue that there is another possibility involving migration, and that is that the Earth itself began life nearer to, or within, the asteroid belt. It would then have maintained its early primordial waters before itself migrating inwards to its current position as a result of a significant cosmic encounter. That event may have also lent a hand in the creation of the present asteroid belt, whose outer reaches contain waters which show a strong isotopic relationship to our own world's water. This may include cross-over objects like 'main-belt comets' (9). The migration inwards of the Earth would have involved an encounter with another world, now beyond our sight. This lost world may now be the much sought-after Planet X (1), or Planet Nine (5), the provenance of which remains so deeply mysterious.